While Chicago Mayor Rahm Emanuel continues to hide from reporters and the public, his challenger in the April 7 runoff election continues to gather support across the city. 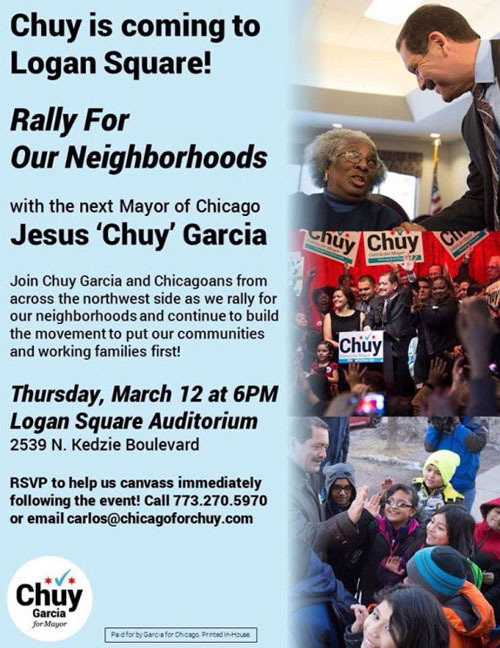 Cook County Commissioner Jesus "Chuy" Garcia, who is pitted against Emanuel, will be in Chicago's Logan Square neighborhood on Thursday, March 12, 2015 for a rally that is expected to overflow the Logan Square auditorium. The event is scheduled for 6:00 p.m. on March 12 at the Logan Square auditorium, 2539 N. Kedzie, on the east side of the boulevard between Fullerton and Logan. On March 11, Garcia joined Chicago Teachers Union delegates (including this reporter) during a CTU training session at the SEIU Health union center on S. Halsted. Chuy will be thanking voters from Logan Square and other parts of Chicago on March 12, while supporters plan to organize a canvass following the event as Chicago's weather finally grows warmer.Chuy is expected to speak, answer questions, and be with the people whose votes helped put him into the April 7 runoff against incumbent Mayor Rahm Emanuel. The Garcia for Mayor campaign is asking supporters to join in a canvass of voters after the event. The runoff election pitting the multi-million dollar Emanuel campaign against the grass roots Garcia campaign culminates on April 7, election day. Early voting begins March 23. While Chuy Garcia has been making the rounds across Chicago and mingling with voters, his opponent, Rahm Emanuel, shows more and more signs of panic as his versions of reality crash despite millions of dollars in Rahm's coffers, celebrity support from Hollywood to the White House, and a promotional staff that includes a dozen people paid for by the taxpayers as part of what has been called "The Mayor's Press Office" since Rahm's 2011 election. Emanuel has been trying to prevent unscripted meetings with the average Chicago citizen since his defeat on February 24, when he was forced into a runoff despite corporate media support from virtually all major media and a last-minute campaign support visit from President Barack Obama. Emanuel is not only running scared from the people, but he is also avoiding the press. On March 10, Emanuel's "Mayor's Press Office," which is paid for by Chicago taxpayers, informed the press that Rahm would be at four events during the day -- and that he would not speak to reporters at any of them! A last-minute addition to Chicago Mayor Rahm Emanuel's media calendar on March 10, 2015, announced breathlessly that the mayor had discovered potholes. The pothole offensive followed by one day Rahm's announcement that he was going to reduce the number of red light cameras that have been ripping off poor and working class people -- especially cab drivers -- since Rahm hired a controversial (and in some cases corrupt) private corporation to do the red light cameras rather than leaving traffic duties with the police where they have been since the invention of the automobile. Above, a press release issued by Chicago taxpayers following Emanuel's pothole press conference on the afternoon of March 10.March 10 was typical of how Rahm has tried desperately to control public events. By noon on March 10, the "Mayor's Press Office" had issued two announcements of the mayor's activities for that day. The press was warned the Rahm would not speak with reporters at any of them. Each event contained the tag line "There will be no media availability..." which means that the mayor's phalanx of aides and security people would bar reporters who tried to ask questions during the final weeks before the April 7 voting. One of the events (see below) even told the press that the only media activity permitted would be for "B roll..."
Mayor Emanuel will preside over a meeting of the City Council. 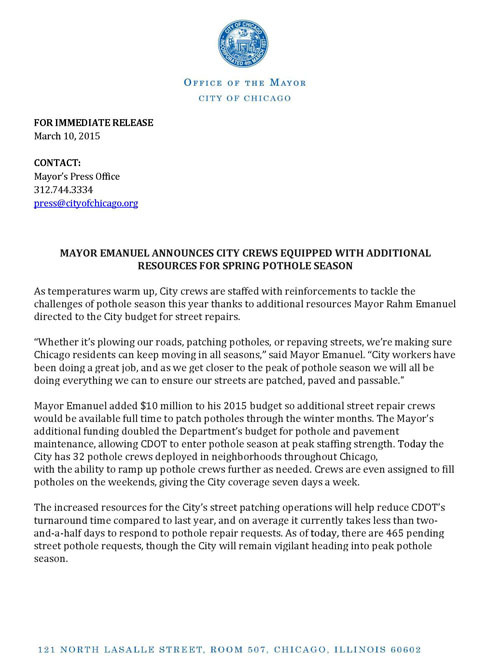 Mayor Emanuel will greet pothole crews and discuss the additional City resources available to patch potholes this year. **There will be no media availability following. Mayor Emanuel will preside over a meeting of the Public Building Commission. Mayor Emanuel will deliver remarks at the Boys & Girls Clubs of Chicago's "2015 Youth of the Year" event. LOGAN SQUARE � Mayoral candidate Chuy Garcia has scheduled stop in Logan Square Thursday to rally supporters ahead of the April 7 election. Garcia�s �Rally for the Neighborhood� starts at 6 p.m. March 12 at the Logan Square Auditorium, 2539 N. Kedzie Blvd. In the Feb. 24 election, Garcia, a Little Village resident, attracted strong support around Logan Square, Humboldt Park and Hermosa � a base of support second only to the city�s Southwest Side, according to voting data. That support is bolstered by incoming 35th Alderman Carlos Ramirez-Rosa, who swept the ward vote against Ald. Rey Colon on a progressive platform that included a pledge to support Garcia�s campaign for mayor. Garcia has a campaign office in Logan Square. The Thursday rally will be followed by a neighborhood canvassing event organized to �build the movement to put out communities and working families first,� according to an announcement. Garcia faces Mayor Rahm Emanuel in the runoff contest. The campaign ask those interested in helping canvass following the Thursday rally to call 773-270-5970 or email carlos@chicagoforchuy.com.